More recently, the ATtiny has gained semi-official support given the variants posted by David Mellis on Github. Please note that this new firmware specification has a different pinout than the one used by the Arduino Tiny project. It is therefore best to base your projects on this newer version. In response to that article, there has been considerable interest in the differences between the ATmega based Arduino compatible boards and ones based on ATtiny chips. There has also been some confusion over these differences as well. This article is meant to address those differences and clear up any confusions. Wiring is an open-source programming framework for microcontrollers. Since the aforementioned is probably still confusing, permit me to state the matter plainly. The Arduino is programmed using the language C++, and makes use of the framework library Wiring. There is no Arduino programming language. What the Arduino IDE (integrated development environment) does is hide the complexities of C++ compilation and linking via the Processing IDE. Behind the scenes it uses the GNU GCC compiler for C++, and links internally to both the AVR Libc library and the Wiring library. Try doing that using straight C code. and you’ll see how much easier using C++ is. C++ can be complicated when trying to create complex class constructs, overloading operators, etc., but when using existing library code, it is as easy as Java or any other simplified object oriented language. You may also read in various sources that the Arduino is programmed in C. That is not entirely correct either. Using the previous example to illustrate, it is heavily dependent on the object oriented capabilities of C++. Since C++ was designed to be backward compatible with the C language, the two terms are often thrown about interchangeable today. When it comes to programming micro-controllers however, straight C is often used because of its extreme efficiency. It is also a major point of departure with the Arduino in its use of C++. While you are free to use any of the more primitive C constructs such as you’ll find in most non-Arduino AVR programs, Arduino sketches have the distinction of using the more powerful features offered by C++. It is this use of C++ that makes the Arduino so much easier to program than traditional methods using just C.
While the Wiring framework part is pretty basic, its two simple functions provide an excellent starting point for organizing and writing an Arduino sketch. In this example, you can see the library functions: pinMode, digitalWrite and delay. These replace complex C-based register manipulations that make micro-processor programs difficult to write, difficult to debug, and difficult to understand. It is this wonderful, high-level interface to the AVR chip that makes the Arduino such a compelling platform, and is probably what lends so much weight to the idea that it is its own language when it is really C++ with a great abstraction library. Each AVR chip supports a different number of digital and analog pins. Mapping from AVR registers to Arduino numbered pins is done by the code from David Mellis github repo, and extended to support 20-pin chips in the forked version over at ProvideYourOwn’s github repo. That mapping will be covered in the next section. The following table compares the number of GPIO (general purpose IO) pins and the number of analog pins supporting analog to digital conversion. NOTE: The number of available ouput pins reflect those not available due to being the RESET pin, and supporting clock crystals in the case of the ATmega serias. * While the ATtiny x5 series of chips support 4 PWM pins in hardware, the current variant definition does not. ** Two of the PWM timer outputs can actually drive up to 4 pins each. Each of these 4 pins would have the same PWM output waveform of course. GPIO pins can be used for digitalRead() and digitalWrite(). Since all analog pins support GPIO, they are a subset of the total number of GPIO pins. For example, in the basic Arduino, it is often considered that there are 14 digital pins, numbered 0 – 13. There are actually 20, numbered 0 – 19. The last 6 pins are analog pins. For sake of clarity, digital pin number 14 is the same as analog pin number A0. Either constant can be used in calls to digitalRead() and digitalWrite(). To obtain the number of pins exclusively for digital I/O, simply subtract the number of pins supporting ADC (analog input) from the number of GPIO pins. Another popular feature of the Arduino is PWM (pulse modulated output), expressed in the Arduino library as analogWrite. As you look at the table, there is not a lot of difference between the various chips. All the ATtinys (except the tiny13, tinyX61 & tinyX7) feature 4 PWM outputs, while the ATmega has 6. One last item to mention is the fact that there currently is no variant support for ATtiny13 series. The tiny13 is very similar to the ATtinyx5 series, so it would not be difficult to add the necessary code. The tinyx61 series and tinyx7 series chips are well worth considering. With their whopping 10 analog pins, they are a real sensing powerhouse. While Provide Your Own’s github supplies these variants, they are currently untested. AVR chips support two kinds of interrupts – a multi-state interrupt and a pin-change interrupt. The Arduino library only supports the multi-state interrupt through the functions attachInterrupt() and detachInterrupt(). There are only two pins supporting the multi-state interrupt on most Arduino boards, and are designated by INT0 or INT1. Most ATtinys sport only one of these interrupt pins (Int0) as seen in the previous table. The pin change interrupt is usually available on all GPIO pins for AVR chips. While the Arduino language doesn’t support it, there are community supplied libraries that do. The PinChangeInt library is an excellent one that makes attaching interrupts to any pin desired a breeze. The ATmega series has a total of 3 timers. Each timer has its own special set of features. For most applications, the explicit use of the timers is not required, and when they are, the spec sheets for the chip in question can always be consulted. One of the primary uses for timers is to perform the PWM function. The number of pins supporting PWM is twice the number of timers. Each timer expresses its output on two pins – one pin is always low, while the other pin is high. In the Arduino library, except for PWM, only one timer is used – Timer 2. On the Ardunio, Timer 0 is used for basic timing operations unrelated to PWM output. The Arduino functions that make use of this timer are: pulseIn(), millis(), micros(), delay(), and delayMicroseconds(). Timer 1 is used for the tone() function. That leaves Timer 2 free for custom timing operations. The various ATtiny chips (except for the ATtiny13) have only two timers, which provide for the exact same functionality offered in the Arduino library as the ATmega series does. The variant file for each of these chips maps these timing functions to the appropriate timer for each ATtiny chip used. You normally won’t need to worry about which timer is used unless you need to change the timer frequency or make some other use of the timer. You can see which timer is used for these functions in the file core_build_options.h. The basic Arduino boards make use of either a quartz oscillator or a ceramic resonator to keep accurate time. In most ATtiny projects, neither of these devices are used, leaving the two pins they use free for other types of I/O. In my previous table on the number of pins available, this practice was taken into account in the table. Both the ATmega series as well as the ATtiny series chips have both internal oscillators and can make use of more accurate external ones. The use of an oscillator makes little difference in the code of your projects, other than the reduction of available pins by two. A factor that does make a difference is the clock speed your chip is running at. The default clock speed (as shipped from Atmel) for both the ATmega series chips as well as the ATtiny ones is the 8MHz internal clock with a prescaler of 1/8, which yields an actual clock speed of 1MHz. These settings can be changed my setting the necessary fuses. Most Arduino boards have them changed to use an external 16MHz clock with a prescale factor of 1. Unless you change the fuse settings, your ATtiny projects will be running at 1MHz, and you need to make sure you select the board running at 1MHz when uploading your sketch. If you accidently choose the 8MHz board, your timing will be off by a factor of 8. If you see your LED blinking really slowly, then you will know what you did wrong. One of these constants as passed as the parameter to the analogReference(type) function. Ethernet – this library is for connecting to the internet using the Arduino Ethernet Shield. Since it uses the SPI hardware that is part of all Atmel chips, it should work with no problem on ATtiny series chips. Firmata – for communicating with applications on the computer using a standard serial protocol. Since all the ATtiny chips except for the ATtinyx313 series lack a hardware based serial I/O, I doubt this library will be usable. SPI – for communicating with devices using the Serial Peripheral Interface (SPI) Bus. This library should work on all Atmel chips. SoftwareSerial – for serial communication on any digital pins. This is a software implementation of serial communications. Since most of the ATtiny series chips lack the hardware for a serial interface, this library will no doubt be useful for many ATtiny based projects. Wire – Two Wire Interface (TWI/I2C) for sending and receiving data over a net of devices or sensors. The ATtiny series chips support I2C/TWI, so one would think this library would work without any problems. However, this thread seems to indicate that it needs modification for the ATtiny chips. One of the contributors has provided a ported version of the Arduino library. If any of these communication protocols are confusing, please consult my earlier article that explains the various Atmel communication protocols and their support in various chips, including the ATtiny. There are some additional libraries provided for the Arduino IDE, that I have listed below. As none of these libraries make use of any special hardware other than the basic functionality of most AVR chips, they should all work without any problems when using ATtinys. Note – there is a minor error in the 861 pinout (above) – pin17 should be D3/AREF (not D10/AREF). Since the ATtiny13 currently does not have a variant file, I am not including its pinout diagram. We have clarified the term Arduino language. Since this language is ordinary C++, any language constructs mentioned in either the Arduino documentation or in C++ literature will be perfectly valid regardless of the Atmel chip you are using. The basic Arduino library, consisting of calls such as digitalWrite(), digitalRead() and so forth have been fully implemented by the Arduino-Tiny project. You can use them without concern in your ATtiny projects. The other libraries included in the Arduino IDE are supported for the ATtiny as well. The only one that is not – Firmata – is because except for the ATtiny x313 series, serial communications are not supported by the ATtiny hardware. The advantages of the ATtiny series chips are numerous – small package size, big capability and ultra-low cost among them. The Arduino IDE and its associated libraries enjoy a high level of support for these chips. Programming them is as easy as any Arduino. There is no reason to not make full use of them in your projects. Feel free to make any corrections, clarifications, and contribute your own knowledge in the comments below. Using ATtiny Chips for Arduino-Like Projects by Provide Your Own is licensed under a Creative Commons Attribution-ShareAlike 4.0 International License. This entry was posted in Tech and tagged arduino, attiny. Section: Article. Bookmark the permalink. Both comments and trackbacks are currently closed. would you be able to give me some direction here ? 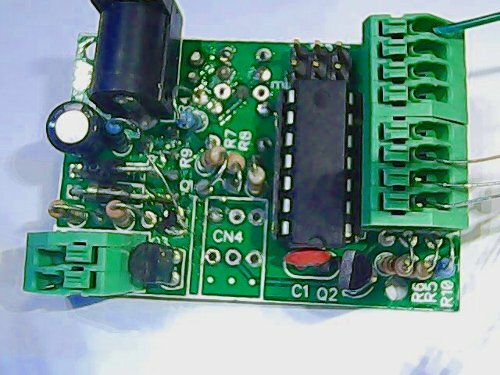 You can try this programmer it claimes it can program ATtiny13/15/25/45/85 with these shield also. I found one here its very cheap and easy no jumpers and breadboard needed. then the compile should work better. I copied the pins_arduino.h into an own github (https://github.com/jipp/attiny) and changed them. Using Arduino IDE > 1.6.3 (nighly build) ATtiny x61 is working – at least for my simple usage. Great webpage, very informative, Thanks! I’ve got a modified version of John ‘smeezkitty’s Attiny13 core along with David Mellis’ Attiny cores working together and running without any bugs – so far – on Arduino 1.6.3. Feel free to check them out here on Github. Any suggestions and comments are welcome 🙂 I’m trying to get a single unified set of cores to work with as many ATtiny variants as I can. Supports ATTiny 84, 85, 861, 4313, 88, 167 and the smaller-flash versions in “classic” core, and 441, 841, 1634 and 828 in the “modern” core. like these are bound to happen. Soccer players need to have enough stamina to sustain on the field for 90 minutes or even more with speed and short bursts of power. Despite this situation I will use Windows. I think that this software is the most understandable in use. community. Your site provided us with helpful info to work on. You’ve performed an impressive process and our entire neighborhood will likely be thankful to you. you be a part of your name for having a bright profession ahead. keywords that they want to target and are specific. also allows changing our handset without changing the phone number. that are physically difficult or take place in environmentally unpleasant conditions.